A permalink is a unique URL that never changes. Each comment has a Comment Permalink, which consists of the URL of the specific post it was submitted to, along with the unique Comment ID at the end. 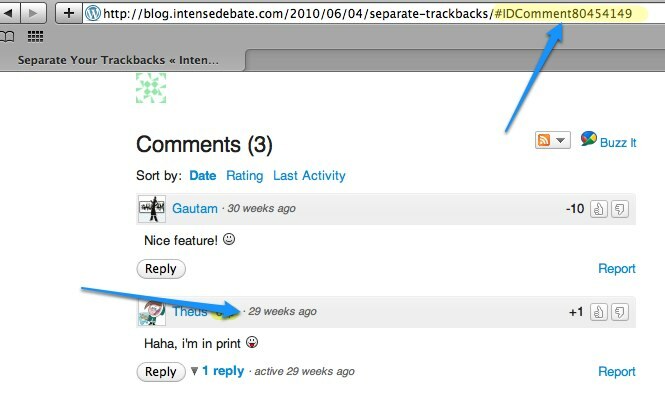 That link consists of the URL of the specific post, “http://blog.intensedebate.com/2010/06/04/separate-trackbacks/“, and the Comment ID, “#IDComment80454149“. 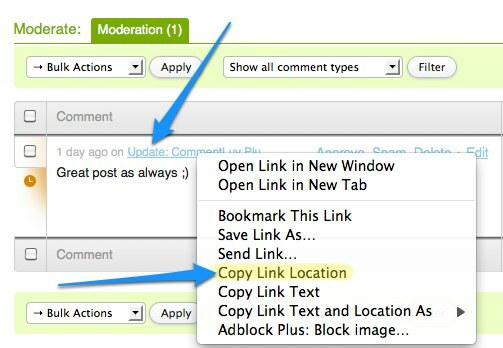 The following sections provide instructions for the different ways you can access Comment Permalinks. If the comment is approved and currently displayed in the comment section then you can locate the permalink using the following instructions. 2. Hover your mouse cursor over the timestamp – ex: 1 week ago. The timestamp is to the left of the username and reputation score. 3. Instead of right clicking on the timestamp, left click your mouse on the timestamp. That will pull up the comment permalink in the address bar of your web browser. 4. 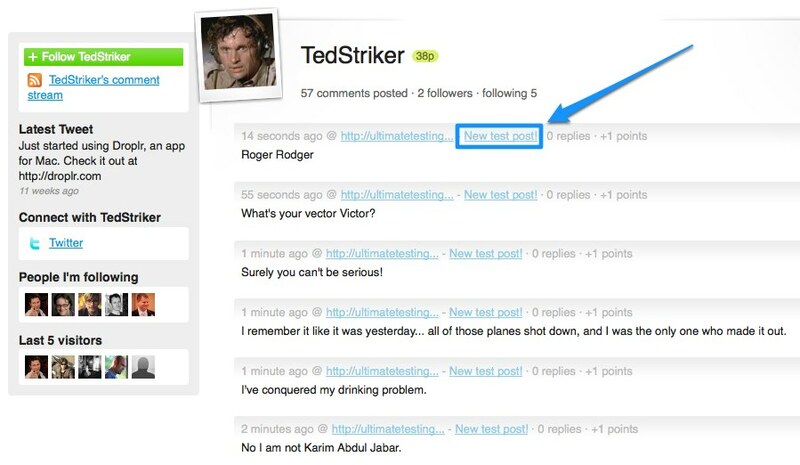 Make sure the URL in your address is the actual comment permalink. The URL will end with #IDComment#####, where ##### is the comment ID. You can easily grab the comment permalink from your Moderation Page for comments that are held in moderation, flagged as spam, or were deleted. 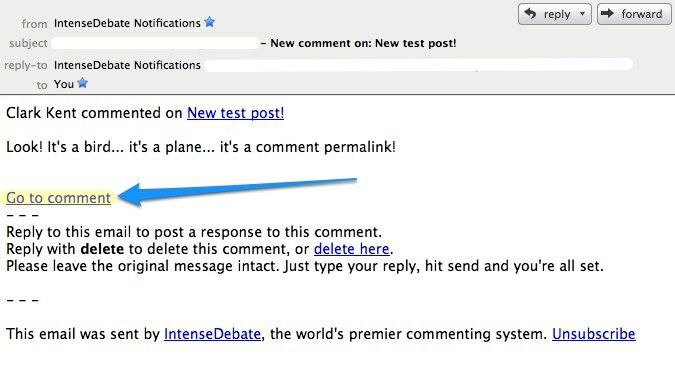 You can always access the comment permalink from your email notification. 1. In the email locate the “Go to comment” link that is included below the comment text. That’s your comment permalink. 3. Click on that link to open up your web browser and view the comment. Then you can copy the link from your address bar in your web browser. 4. Click on that link to open up your web browser and view the comment. 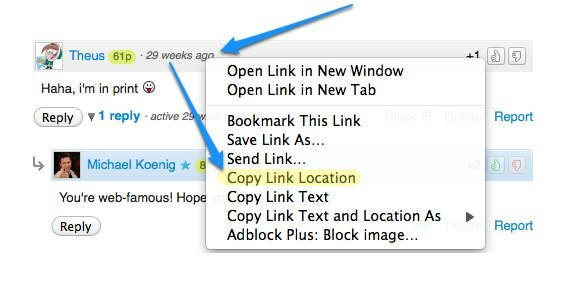 Then you can copy the link from your address bar in your web browser. 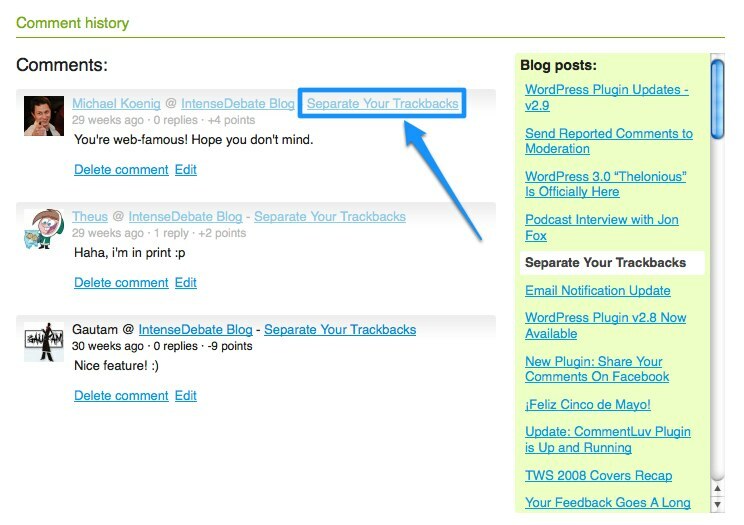 Tags: comment history, comments, moderation, Permalinks, Profiles, Troubleshooting — Can't find your answer here? Let us know.